14 in. x 18 in. 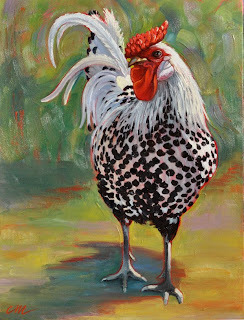 oil on canvas..
From a photo I took of a Hamburg hen that I turned into a rooster. Couldn't do without that big, red comb and wattle. A very striking painting Connie! Thanks, Mona. I have two shows this weekend and barely enough work, so mainly it was a fast painting! You are absolutely right, of course. I was just reflecting one of the comments from the group about feeling sleazy. I guess I"m a push-over--DH told me I blew it by not asking for compensation--something New Yorker's would understand. Since the organization's representative was so unapologetic (upbraiding me for my "sledge-hammer approach" about merely asking that they remove the image they probably had been using for years), I can only imagine how they would have reacted if I had asked them for payment! But I wish I had.